An example of a lien is a payment agreement for a car loan. The loan document includes provisions that allow the lender to keep you from selling the car until you pay what you owe. The word "lien" comes from the Latin for "to bind" (like ligaments, for example). Liens bind a debtor to the lender for a property until the debt is paid off. When the property is sold, the lien must be discharged (paid), so the sale can be completed. The most common types of liens are those that are placed on vehicles or real property. In the case of a vehicle, it's often purchased from a dealer, secured by a loan from a bank, and the bank then puts a lien on it and holds the title. A UCC-1 form is filed to record the lien. The debtor makes payments on the vehicle. At this point, there are three possible outcomes. The debtor might make all the payments and pay off the loan. The bank will release the title when that happens and the lien is removed. Or the debtor might stop making payments. In this case, the bank can use the lien to repossess the vehicle. The bank would continue to hold the title until the vehicle is subsequently sold to and paid for by someone else. The original lien would no longer exist at that point. Finally, the debtor might try to sell the vehicle while he still owes money to the bank. The bank still holds the title. The debtor can't sell the auto until he has the title so must pay off the bank to get it. This is the case if you trade in a vehicle that still has a loan against it. Your financing on the new car would typically include the sum necessary to pay off the first loan. In this case, the lien against the first vehicle is removed but the second lender will hold title to the new vehicle and would have a lien against that one. Consensual liens are those you agree or consent to when you purchase something through financing. You want the loan and it comes hand-in-hand with a consensual lien until you pay it off. 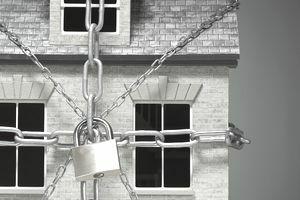 Statutory or non-consensual liens are obtained through a court process to put a claim on an asset for unpaid bills. These can include tax liens—a lien is placed against the property of someone by a federal, state, or local government for non-payment of taxes—or contractor's or mechanic's liens. A contractor might do work for a homeowner but the homeowner doesn't pay him. The contractor, therefore, goes to court to get a judgment against the homeowner for the money. The judgment can be used to place a lien. If the homeowner attempts to sell the property, the contractor's lien would have to be paid off along with any mortgage against the property and any other liens or security interests on it. Judgment liens are also common in small claims court cases. Construction or contractor liens can also be filed against a property owner by sub-contractors who haven't been paid by a contractor. A general contractor doing major renovations on your home might hire a plumber to take care of that specific part of the job. If the contractor doesn't pay the plumber, the plumber can file a lien against your property. Tax liens can be brought against a taxpayer by any taxing authority, like the IRS or a state. If the taxpayer doesn't pay taxes when due, there is a process that must be followed to give the taxpayer a reasonable opportunity to pay the tax before the lien is applied. In the case of an IRS tax lien, for example, the IRS must first send a notice of the tax due and a demand of payment. The IRS says that the lien "attaches to all of your assets [my emphasis](such as property, securities, vehicles) and to future assets acquired during the duration of the lien." Liens against assets must be paid off when the individual using the asset sells it. She can't receive payment for the sale until this happens. In the example of the traded-in vehicle, the lender won't release the title until the lien is paid off in full. You have the use of the property while it's being paid off in most cases but the creditor/lender sometimes actually holds the property. Liens also figure in bankruptcy proceedings because they involve secured loans and repayment of debt. A "release of lien" is a written statement that removes property from the threat of the lien, usually in the case of a mechanic's lien. It's basically a signed document signed by the contractor that prevents having a lien put against the property. It should be signed at payment as proof of payment and as an assurance that the property will not have a judgment placed against it.